Lineage. Constituted 393rd Fighter [Squadron on 26 May 1943. Activated on 15 Jul 1943. Inactivated on 7 Nov 1945. Designated 179th Fighter Squadron, and allotted to MN ANG, on 24 May 1946. 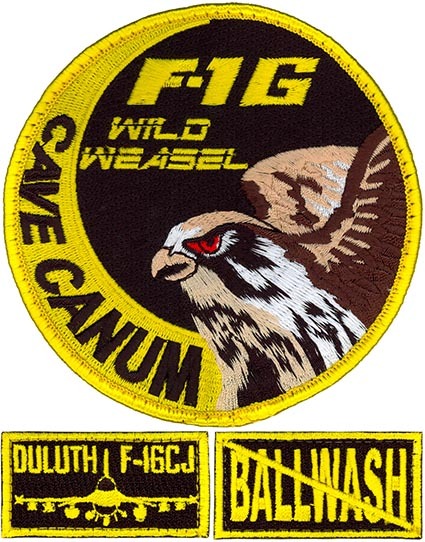 Redesignated 179th Fighter Squadron (SE) and extended federal recognition on 18 Sep 1948. Redesignated: 179th Fighter-Interceptor Squadron on 23 Mar 1951; 179th Tactical Reconnaissance Squadron on 10 Jul 1976; 179th Fighter-Interceptor Squadron on 15 Nov 1983; 179th Fighter Squadron on 15 Mar 1992-. Stations. Hamilton Field, CA, 15 Jul 1943; Santa Rosa AAF, CA, 11 Oct 1943; Oakland MAP, CA, 6 Dec 1943-8 Mar 1944; Stony Cross, England, 4 Apr 1944; Ibsley, England, 6 Jul 1944; Cretteville, France, 27 Jul 1944; Cricqueville, France, 15 Aug 1944; Peray, France, 4 Sep 1944; Clastres, France, 12 Sep 1944; Juvincourt, France, 28 Oct 1944; St Dizier, France, 1 Feb 1945; Conflans, France, 15 Mar 1945; Frankfurt/Eschbom, Germany, 10 Apr 1945; Crepy-en-Laonois, France, 4 Jul-16 Aug 1945; Seymour Johnson Field, NC, 15 Sep-7 Nov 1945. Duluth MAP (later Duluth ANGB), MN, 18 Sep 1948-. Aircraft. P-39, 1943-1944; P-38, 1944-1945; P-47, 1945. F-51, 1948-1954; F-94, 1954-1959; F-89, 1959-1966; TF/F-102, 1966-1971; F-101, 1971-1976; RF-4, 1976-1983; F-4, 1983-1990; F-16, 1990-. Operations. Combat in ETO, 9 May 1944-7 May 1945. Called to active duty as part of the Korean War call-up, 1 Mar 1951-1 Dec 1952. Provided air defense of Minnesota and northern US. Assumed 24-hour alert status in support of the Air Defense Command mission in Duluth, Jul 1960-Jan 1976. All weather, high or low, day or night, selective reconnaissance with the capabilities to deploy to a wide variety of operating locations, 1976-1983. Air defense of Northern US, 1976-. Provided aircraft and personnel to Operation Creek Klaxon, 1986-1987. Provided detachment to Loring AFB, ME, to take over alert commitment from the 101st FIS while the MA ANG unit was converting to F-15, 1987. Provided detachments to Fresno ANGB and George AFB, CA, to take over alert commitment from the 194th FIS while the CA ANG unit was converting to the F-16, 1989. Tasked with a permanent detachment duty, Det-1 was an alert status mission based at Tyndall AFB, FL, Oct 1995-2003. Became a general purpose tactical fighter squadron tasked with air-to-air and air-to-ground combat operations, 1995-. Campaigns. Air Offensive, Europe; Normandy; Northern France; Rhine-land; Ardennes-Alsace; Central Europe; Air Combat, EAME Theater. Decorations. Distinguished Unit Citations: France, 25 Aug 1944; Germany, 19 Mar 1945. Cited in the Order of the Day, Belgian Army: 6 Jun-30 Sep 1944; 16 Dec 1944-25 Jan 1945. Belgian Fourragere.